In Auto and Auto Flash Off exposure modes, your Nikon D7000 tries to figure out what type of picture you want to take by assessing what it sees through the lens. If you don’t want to rely on the camera to make that judgment, your D7000 offers Scene modes, which are designed to automatically capture specific scenes in ways that are traditionally considered best from a creative standpoint. Usually, Scene modes also apply color, exposure, contrast, and sharpness adjustments to the picture according to the traditional characteristics of the scene type. Landscape mode typically results in more vibrant colors, especially in the blue-green range, for example, whereas Portrait mode typically produces a softer image with more natural tones. The Scene modes are a great way to start taking control over your pictures, and if nothing else, they encourage you to think about the characteristics that go into different types of photos. But don’t expect miracles, especially if the lighting conditions or subject matter is challenging. There’s also the whole notion of creative input to consider. Sure, most formal portraits feature a blurred background. But maybe you want to keep the background in focus because the setting is important to the story you’re trying to tell — think of a shot of newlyweds standing in the front yard of their very first home, for example. The details of the yard and home likely will be just as important to the couple when they look back on that photo in years to come. Long story short: Experiment with the Scene modes while you’re discovering more about photography. But if you’re not happy with your results, don’t just keep trying over and over with the same Scene mode — you’re not going to achieve anything different. Set the Mode dial to Scene. Rotate the Main command dial one notch. 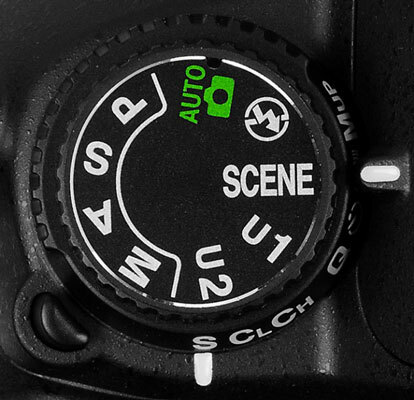 Rotate the Main command dial again to choose a different scene. As soon as you rotate the dial, the display changes to show a roulette wheel of scene types. Keep spinning the dial to cycle through all the options. When you find a Scene mode you like, stop rotating the Main command dial. From here on in, everything works as it does for the Auto and Auto Flash Off exposure modes with the exception of your Flash mode choices and the default autofocusing behavior, which vary depending on the scene type you select.